Working with Professor of Psychology & Counseling Gina Mireault, four students shared a rewarding opportunity, presenting a research project at the annual Eastern Psychological Association (EPA) conference in NYC. The conference took place Mar.1-4, and hosted students presenting over 300 posters on psychological research. Kelly Woodard, Christine Petinatto, Sarah Sienna, and Chelsea Lamore have been researching, analyzing, coding, and collecting data with Mireault since the summer of 2012 as part of a research project as psychology majors, and they recently submitted their findings to the EPA. 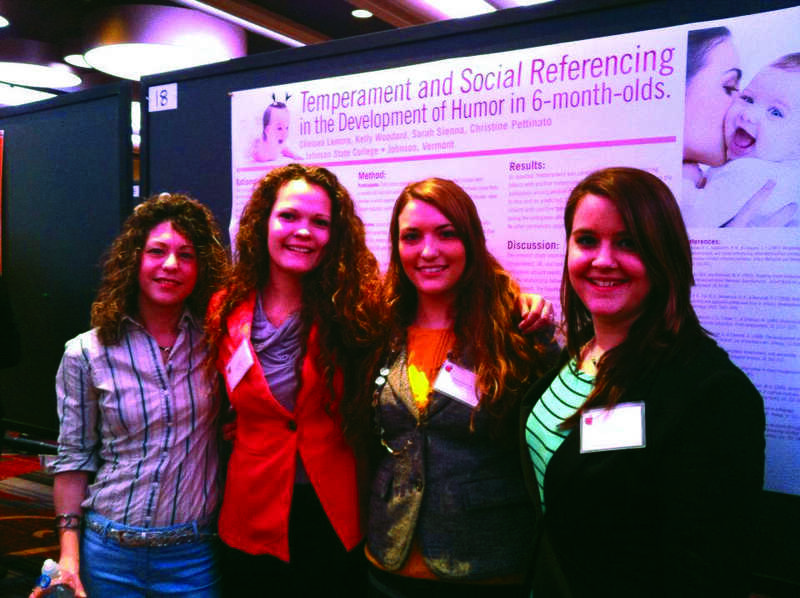 The research was on temperament and social referencing in the development of humor in 6-month-olds, and, in presenting its hypothesis, the team became a part of its field in a real way outside the walls of a classroom. For some people, the conference may have felt overwhelming, but for the students representing Johnson State, the conference solidified their hopes for a future in their field. The team felt as if they were where they were supposed to be. Over the four-day conference, Woodard, Petinatto, Sienna, Lamore, and Mireault attended lectures, watched poster presentations on a number of current research topics in psychology, and got the opportunity to sit in on Philip Zimbardo’s talk. Zimbardo is an icon in psychology. He has done a lot of work in Heroism and Evil, but is most well-known for his Stanford prison experiment in 1971, in which he and his colleagues created an experiment that looked at the impact of becoming a prisoner or prison guard. He performed the experiment on college-aged adults who were normally healthy, psychologically and physically, and who knew they would be going into a prison-like environment. Zimbardo wanted to witness what would happen to each participant when thrust into the prison setting. The trip, which was part of the team’s internship required for graduation, gave the participants a brief insight into the field in which they hope to work. According to Mireault, there may have been some sort of reward for the best poster, but that wasn’t the point of the trip. The point was coming together with other researchers in their field, and being able to contribute, because contribution is an important aspect of the college experience.